Following an academic and skills-based curriculum, the University of Miami Intensive English Program integrates essential learning skills, such as listening and speaking, writing and reading, into one complete study program. Our programmes help to prepare students for studying at an university in the US or for work related business purposes. Full sessions start in May, September and January. The Intensive English Programmes also start in February, June and October. IEP students attend class Monday through Friday. Students in Levels 1, 2 and 3 are in class 23 hours a week. Students in Levels 4 and 5 attend 20 hours of class. My name is Javier Rey and I'm from Bogota, Colombia. 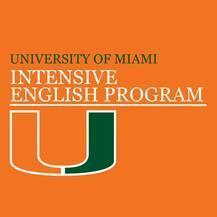 I strongly recommend the Intensive English Program (IEP) at the University of Miami for several reasons. First, the University of Miami is recognized as an important University, not only in Florida but also in all of the United States. I had a great experience studying there because the professors are not only highly qualified professionals but also they become your friends and guide you through the course. Not only the professors are great, but also the staff that you can find in the program are exceptional; they make you feel comfortable and they make you feel like a part of a huge family, the IEP family, which has launched alumni from all over the world with successful careers. The different courses and the classes they offer are amazing; the values your learn there from the real American culture are important, the facilities are clean and everything is very well organized, and the service from all the staff members is 5 stars. I also had the opportunity to study english abroad in important cities around the world such as Washington D.C. and Manchester. But studying at the IEP at UM is incredible because you can find people from all over the world and make great friends and great networking for the future. Last but not least, the program offers you thousands of activities to do during your courses. I'll always recommend the IEP program to my friends and family and hopefully in the future I could send my children to live the incredible experience I had. Thanks IEP. The IEP at the UM is the best! The IEP is a great English program! It was the best time in my life! It was an amazing experience in learning language, knowing new culture, making new friends, and studying in a very friendly and relaxing atmosphere! Professional faculty will help you to improve your English! A lot of exciting activities will help you to adopt to the new environment! My name is Chengmin and I am from China. I think it’s a it has been a very memorable time in my life because there are many activities in every each semester. Moreover, the teacher in here are kindly, they try to make us understand every word they said say and make the difficult points easier for us. They have many ways to encourage me to avoid nervousness and make me feel relaxed. In addition, the environment in the IEP is suitable for studying English, since the there are many students from different countries’ students in every class. Before I came here, I felt nervous and didn’t think I can hold could take the college classes, but because of the IEP, I have had a transition period that can help me overcome the difficulty of language. My name is Yacoub Hanna. I'm from Palestine. I have finished the whole 5 levels in the Intensive English Program. The courses were very good. Kept us engaged and exited about the next class. The activities involved provided us with life experience, knowledge, social skills and face to face communication. My English language has improved exponentially from the time i started. I'm so grateful to my teachers, support staff, and everybody involved in helping me learn and have a great time doing it. the campus of the University is very beautiful, I haven't seen any campus like this in Florida !